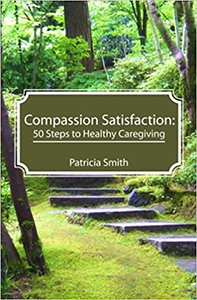 Compassion Satisfaction: 50 Steps To Healthy Caregiving by Patricia Smith. To Weep for a Stranger: Compassion Fatigue in Caregiving by Patricia Smith. Compassion Fatigue Training Workbooks now available! Check out a preview of the Presenters Guide or the Student Guide before you purchase! Healthy Caregiving: A Guide to Recognizing and Managing Compassion Fatigue; Student Guide, Level 1. by Patricia Smith, 2009. Healthy Caregiving: A Guide to Recognizing and Managing Compassion Fatigue; Presenters Guide, Level 1. by Patricia Smith, 2009. The Caregiver's Bill of Rights! Recent workplace violence highlights the need for employers to do everything possible to protect their employees. This is particularly important in caregiving environments in all of the helping professions due to the emotional and often intense interactions caregivers experience on a daily basis. The Compassion Fatigue Awareness Project has compiled a “Zero Tolerance” workplace violence template for concerned caregiving organizations to post within plain view of staff, visitors, consultants and anyone else who enters the premises. We urge you to use this template as is, or edit it to mirror the language of your distinct corporate culture. For further information and materials on workplace violence, go to the United States Department of Labor Occupational Safety & Health Administration (OSHA) website at www.osha.gov. Caregiver Stress: Remembering to Take Care of Yourself, by Fawne Hansen, 2014. Compassion Fatigue and the Female Caregiver, by Patricia Smith. Burdens Do A Body Good, November 16th, 2011. Note to Self: Let It Go, by Patricia Smith. Spry Living, September 1st, 2010. Doctor and Patient: Offering Care for the Caregiver, by Pauline W. Chen M.D. New York Times, January 22nd, 2010. Compassion Fatigue: When Caring Hurts Too Much, by Rick Asa. Academy of General Dentistry Impact, December 2009. Recognizing and Managing Compassion Fatigue: A Path to Wellness, by Patricia Smith. Families of Loved Ones, Summer 2009. Courage and Caring: Step Up to Your Next Level of Nursing Excellence, by Sandra Ford Walston. www.sandrawalston.com. Moral and Ethical Distress a Heavy Burden for Nurses, by Melissa Wirkus. NurseConnect.com, 2009. Compassion Fatigue: How Much Can I Give? by Peter Huggard MPH, MEd. Medical Education, 37(pp163-164). 2003. When the Caring Gets Tough; Compassion Fatigue and Veterinary Care, by Peter and Jayne Huggard. VetScript, May. 2008. Taking Flight: Wounded Warriors who fought for freedom find it anew underwater, by Renee Duncan. Alert Diver, September/October, 2008. Utah medical unit departs to care for Iraqi detainees, by Matthew D. LaPlante. Salt Lake City Tribune, September 17th, 2008. Transforming Compassion Fatigue Into Compassion Satisfaction: Top 12 Self-Care Tips for Helpers, by Françoise Mathieu, M.Ed., CCC., Compassion Fatigue Specialist. Rehab and Community Care Medicine, Spring 2007. Dark Water: Stress After Trauma, by Opal Rose, 2007. A highly-personalized account of the journey from post-traumatic stress to healing. Understanding and Preventing Compassion Fatigue; A Handout for Professionals, by Dr. Angelea Panos, 2007.